Palm press fibre is a by-product of the extraction of palm oil from oil palm fruits (Elaeis guineensis L.). This fibrous residue is obtained after the crude oil is separated from the sterilized fruit by means of a screw-press (see Figure). It may contain important amounts of residual palm oil. 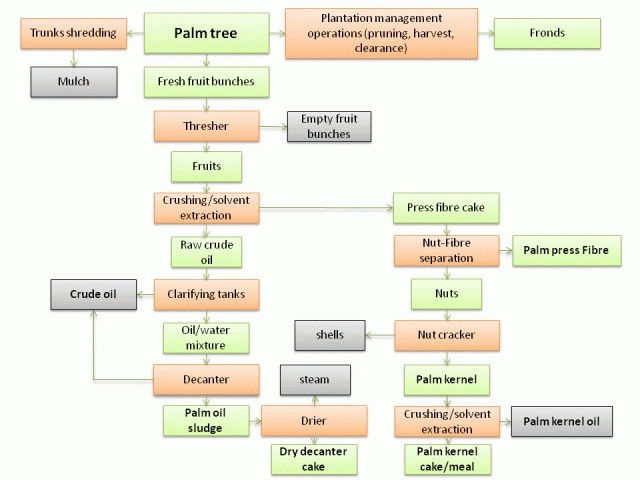 Palm press fibre accounts for 10-15% of the fresh fruit bunch. It can be mixed with empty fruit bunches and kernel shells to be used as biomass fuel: it is one of the main sources of energy to run oil mill plants (Pickard, 2005; Pérez, 1997). Palm press fibre has been described as being of a deep yellow-tangerine colour, with a fibrous consistency, sweetish smell and greasy-like texture (Ocampo et al., 1990a). A ligno-cellulosic material with usually a high fibre content and high oil content, palm press fibre is not considered to be a good feed, but there have been several successful attempts to use it for pigs and to improve its value for other livestock. Palm press fibre is a relatively fresh product available in the immediate vicinity of palm oil mills. The oil retained in palm press fibre makes it a good combustible material and its predominant use is as biomass fuel for oil mill plants, where it is burned to produce steam for generating electricity. This saves large amounts of diesel fuel and is a convenient method of disposal (Thambirajaha et al., 1989). However, some factories can only use about 30% of the available palm press fibre and the rest is considered as waste (Prasertsan et al., 1996). The ash from the burning of palm press fibre does not contain sufficient nutrients to be used as a fertilizer, and dumping creates an airborne hazard and pollutant. It has been incorporated in concrete as a replacement for cement (Pickard, 2005). Composting palm press fibre with poultry litter and urea has been successfully tested and studies indicate that this compost mixed in sand and loam may enhance crop production (Thambirajaha et al., 1989). Increasing the consumption of palm press fibre by livestock, if possible near the production site to avoid wastage, palatability issue and transportation, has been proposed as a means to minimize pollution (Devendra, 1985). Palm press fibre is a bulky, fibrous and highly variable material that is usually neither very palatable nor very digestible in livestock. Its initial DM content can be as low as 63-66% (Pérez, 1997; Devendra, 1979), which tends to reduce its shelf-life, although samples described in the literature are often drier (DM more than 85%). Protein content is low, in the 4-8% DM range. The fibre and oil contents, while generally high, depend on the oil extraction process and on the amount of fibrous residues left or added to the press fibre, particularly kernel shells. As a result, the oil content varies from 2-4% (Shibata et al., 1988a; Abu Hassan et al., 1996) to 15% and more (Devendra, 1979; Ocampo et al., 1990a; Obese et al., 2001). Values of 6-8% oil have also been reported (Pérez, 1997). Press fibre is sometimes defatted (Devendra, 1979; Abdullah et al., 1992). Palm press fibre is always a fibrous material, with ADF values in the 40-50% DM range and lignin values over 13% DM. However, in Colombia, an oil-rich (23% DM) palm oil residue called cachaza de palma was reported, which contains only 15% crude fibre in the DM, possibly because it does not include other lignified material (Ocampo et al., 1990a). Palm press fibre is a bulky feed that cannot be consumed in its raw form by ruminants in amounts adequate to support profitable production (Jalaludin, 1996). It is acceptable to ruminants only at a low level of inclusion and early studies concluded that the optimal level of palm press fibre inclusion was 10%. Crude protein and crude fibre digestibility decreased when the inclusion rate exceeded 25-30% (Göhl, 1982; Devendra, 1985). Supplementation with a protein source, including a relatively poor one like palm kernel meal, is necessary (Devendra, 1985). The fibre can be dried and pelleted to overcome the problems of poor keeping quality and bulkiness (Göhl, 1982). Because the potential for using palm press fibre for ruminant production is important, there have been several attempts to enhance its nutritive value by chemical treatment (urea, ammonia, NaOH) and by manipulating the ration to optimise rumen fermentation (Jalaludin, 1996). In Malaysia, with crossbred cattle fed with various palm kernel meal:palm press fibre ratios (90:10, 70:30, 50:50), the highest daily growth (563 g/d) was reported for the lowest inclusion (10%) of palm press fibre (Hutagalung et al., 1986). A diet based on oil palm by-products (palm kernel cake 30%, palm press fibre 15%, palm oil mill effluent 18%, molasses 35% plus urea and minerals) met the nutritional requirements of dairy cattle (Shibata et al., 1988a; Shibata et al., 1988b). Palm oil mill effluent and press fibre combined in equal proportions can constitute up to 50% of the cattle ration but this blend should not be stored for more than 36 hours as it rapidly becomes unpalatable (Göhl, 1982). Buffaloes increased their voluntary intake of palm press fibre (360 g/day) when it was sprayed with molasses and supplemented with fish meal (Jalaludin, 1996). In vitro OM digestibility of palm press fibre is extremely low (15-20%), although defatting increased it (up to 26-32%), as did treatment with 5% NaOH (29-35%). However, these levels were below the digestibility required in a viable feedstuff (Obese et al., 2001). Intensive steaming and explosive depressurization increased OM digestibility up to 42 and 52% respectively (Shibata et al., 1988b). In another trial DM digestibility increased from 43% to 58% when palm press fibre was treated with 8% NaOH (Jelan et al., 1986). In an earlier trial, however, chemical treatment using NaOH or Ca(OH)2 did not improve digestibility of crude fibre in palm press fibre due to the formation of soaps (Devendra, 1985). Palm press fibre is poorly degradable in the rumen. In both an in sacco study and a fermentation study carried out with rumen fluid, palm press fibre, raw or treated with ammonia, were among the less degradable and fermentable materials tested, which included palm kernel cake, Guinea grass (Megathyrsus maximus), coconut waste and rice straw (Ho et al., 1994). The 48h rumen disappearance of DM and crude fibre were also much lower for palm press fibre (18-22% and 11-12% respectively) than for palm kernel meal and palm oil sludge (Shibata et al., 1988b; Vadiveloo et al., 1992). The rumen degradability potential of palm press fibre silage was improved by supplementing with a urea-molasses mixture (Kositkajorndet et al., 2009). Buffaloes fed urea-treated palm press fibre had significantly higher voluntary feed intake when a supplement of both energy and protein was given, compared to those receiving only protein or energy (Jalaludin, 1996). In India, the optimum conditions for effective ammoniation of palm press fibre was 4% urea at 40% moisture for 20 days, which made it suitable as potential substitute for conventional roughages (such as groundnut haulms) to buffalo bull calves (Dayal et al., 2002). In Colombia, the low fibre (crude fibre 15% DM) palm residue cachaza de palma was tested as a potential pig feed in the early 1990s. When this residue replaced 25 to 100% of sorghum grain (with soybean meal as the protein supplement) the best growth performance (649 g/d) and the highest profitability were obtained at the highest substitution levels (75 and 100%) (Ocampo et al., 1990a). In a subsequent trial, reducing the amount of dietary protein down to 200g/d, by decreasing soybean meal supplementation, resulted in better economic results (Ocampo et al., 1990b). Supplementation with methionine and/or B-complex vitamins failed to improve performance (Ocampo, 1992). Devendra, C. ; Muthurajah, R. N., 1976. The utilization of palm oil by-products by sheep. Preprint No. 8, Malays. Int. Symp. on Palm Oil Processing and Marketing, June 17-19th, 1976, Kuala Lumpur, 21 pp.